**I am posting this and asking for you to please keep Ryan in your thoughts and prayers. If everyone who sees this could please send out some positive energy for Ryan and his family in whatever way you can, whether it be prayers, good thoughts, best wishes or just anything positive, I know it would help. Thank you so much. The family of a teenager who had his legs amputated after complications following a heart transplant, say they have been “overwhelmed” by support from the community in Dungiven, County Derry. Hundreds of people turned out on Sunday for a fundraising walk for the teenager. Ryan O’Connor is currently in hospital in Newcastle-upon-Tyne. Ryan’s aunt, Tricia Harkin, said he is an heroic figure. “He was born with a congenital heart disease. “In the last year his heart started to deteriorate and he did need a transplant. “He has been in Newcastle for 15 weeks and five weeks ago he got the news that a donor had been found. “This was all Ryan wanted, a new heart and a new start. Ryan’s mother and father are with him at the hospital in Newcastle, and Tricia is in constant touch with them. She said: “At the moment he isn’t too good. “He has suffered a bleed to the brain and there has been no change for the last week or so. 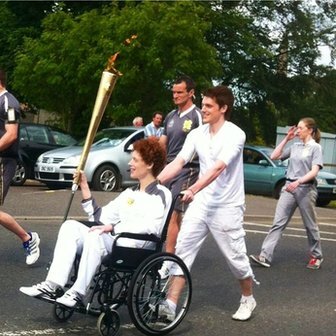 Tricia said the family are taking comfort from the numbers who turned out for Sunday’s sponsored walk. “There were so many strangers there, people we will probably never know but we’d like to thank them for turning out on such a bad day. We were absolutely overwhelmed. “Ryan is very special, he has touched so many hearts and I am looking forward to all those people meeting him. “He has been so brave and so positive. 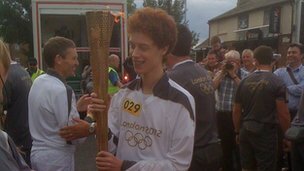 “Last summer he had the honour of carrying the Olympic torch. 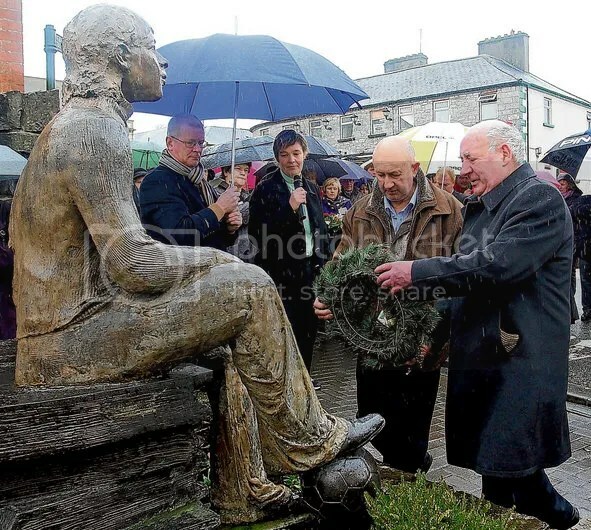 “It was fantastic, he carried it through Ballykelly where his granny and grandad are from..
A Mass and commemoration service was held in Belturbet, Co Cavan, yesterday to mark the bombing that claimed the lives of two teenagers there 40 years ago. On December 28th, 1972, a car bomb exploded in the town, killing local girl Geraldine O’Reilly (15) and Paddy Stanley (16) from Clara, Co Offaly. She was buying chips when the bomb went off. He was in a phone box talking to his parents. Others were injured in the explosion and the bomb devastated the small border town. A loyalist group is alleged to have been responsible, but no one has ever been charged. A monument was erected in 2007 on the site of the bomb. The victims’ families continue to press for an inquiry into the bombings, and the call was repeated by the Justice for the Forgotten group yesterday. Sinn Féin TD for Cavan Monaghan Caoimhghín Ó Caoláin called on Minister for Justice Alan Shatter to release the files in his department on the incident. The call came after it emerged yesterday that a Freedom of Information request by RTÉ’s This Week programme had been refused by the Department of Justice. The British prime minister, David Cameron, has today described loyalist/state collusion revealed in the de Silva review relating to the murder of solicitor Pat Finucane as “unbelievably ghastly”. The Pat Finucane Centre, however, believes those words would be better applied to the British government’s continuing refusal to establish a full, public, independent inquiry. 1. The UDA, whose gunmen (including RUC agent Ken Barrett) murdered Pat, whose “intelligence” unit was headed by a British military agent (Brian Nelson) and whose “quarter-master” (Billy Stobie) provided the weapon used (stolen from a British Army barracks in Holywood, County Down) was a legal organisation at the time of the murder. It took a further three years before the UDA was banned. The Pat Finucane Centre has uncovered documents showing that, as far back as the early 1970’s, the UDA was viewed as a “release valve” for “Protestant extremists”. 2. In January 1992, the then Department of Public Prosecutions reached a deal (effectively a cover-up), allowing Nelson to plead guilty to five counts of conspiracy to murder. This prevented the courts examining his activities as a British military agent. Nelson was given a derisory ten year prison term. 3. 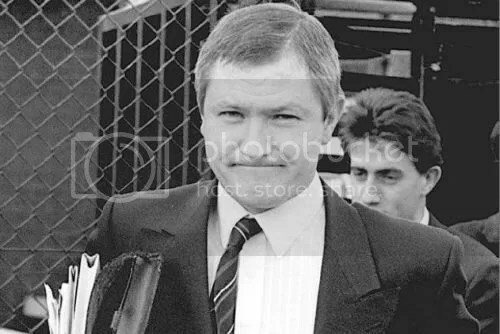 The man who acted as Nelson’s “handler” and who gave him a glowing character reference during the 1992 court hearing was Brigadier Gordon Kerr who became head of the Force Research Unit in 1987, two years before Pat Finucane’s murder. In 1997 (eight years after Pat Finucane’s murder), Kerr was promoted and became Britain’s military attaché in Beijing, where he was awarded an OBE. He also holds the Queen’s Medal for Gallantry. Two weeks after he was identified in the Stevens Report into collusion in the murder of Pat Finucane, Tony Blair sent him to Iraq. He has never been charged with a single offence. Pat Finucane was stalked by a British military agent who was then given effective immunity by the office of the DPP. The gun used to murder him was of British military origin. It was supplied by one RUC agent and fired by another RUC agent. Pat Finucane’s murder was authorised and carried out by state agents. What more evidence is needed before London grants the public inquiry demanded by the Finucane family? David Cameron has apologised to the family of the murdered Belfast lawyer Pat Finucane and agreed that there was state collusion between police officers and soldiers and his loyalist killers. Launching the De Silva report (see this post) into one of the most divisive murders of the Northern Ireland Troubles, the prime minister said there were “shocking levels of collusion” in the killing. Cameron told the House of Commons that the depth of the co-operation between the security forces and Finucane’s loyalist killers was “unacceptable”. Addressing parliament, Cameron said that “on the balance of probability”, an officer or officers from the Royal Ulster Constabulary (RUC) did propose Finucane as a target to loyalist terrorists. He did, however, deny there was any overarching conspiracy to use loyalists to target members of the nationalist community or active republicans. “Yet another British government has engineered the suppression of the truth about the murder of my husband, Pat Finucane,” she told a press conference. The prime minister admitted that the report made for “extremely difficult reading” in regard to Sir Desmond de Silva’s findings, such as the revelation that 80% of the Ulster Defence Association’s intelligence information came from official state sources. The UDA was responsible for shooting Finucane dead in front of his family at their north Belfast home in February 1989. His family and human rights campaigners have insisted over the past 23 years that there was collaboration between the UDA in west and north Belfast and members of the security forces. The De Silva report concluded that British army agent handlers “deliberately” helped loyalist gunmen select their targets in Northern Ireland in the 1980s. But ministers may have been unaware that Finucane was being lined up for assassination, De Silva said. The legal supervision of agents in paramilitary gangs was nonetheless woefully inadequate and the high-level ignorance was possibly intentional, his report said. “There was a wilful and abject failure by successive governments to provide the clear policy and legal framework necessary for agent-handling operations to take place effectively within the law,” he said. Those who directed and took part in the murder of Finucane were mainly agents and informers working for the army’s Force Research Unit (FRU). De Silva’s report shows the RUC was aware of two previous plans to kill Finucane earlier in the 1980s but did not notify him of the threat. Addressing the Finucane family, who were in London for the report’s launch, the prime minister said he was “deeply sorry” in relation to the scandal. 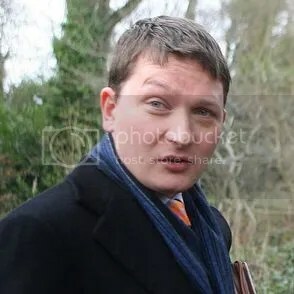 However, he tried to exonerate the former Tory cabinet minister Douglas Hogg over comments he made prior to the Finucane murder in which Hogg said some solicitors in Northern Ireland were unduly sympathetic to the IRA. The prime minister insisted that Hogg made his remark because of briefings he had received back then. The comments Hogg made were not intended to encourage people to attack Finucane, according to De Silva, Cameron added. Amnesty International, however, said the De Silva review had failed the Finucane family and had not delivered them justice. Patrick Corrigan, Amnesty’s director in Northern Ireland, said: “The Finucanes, and indeed the public, have been fobbed off with a ‘review of the paperwork’ – which reneges on repeated commitments by the British government and falls short of the UK’s obligations under international law. The prime minister said he “respectfully disagreed” with the Finucane family over their demand for a full, independent public inquiry and cited the cost of the Bloody Sunday tribunal as one reason for opposing it. He also accepted that RUC special branch was “responsible for seriously obstructing the investigation”. One of the security force whistleblowers in the Finucane case, the ex-military intelligence officer Ian Hurst, who belonged to a secretive army unit running agents inside the UDA, said there was little chance of either police or military handlers or their loyalist informers facing the courts. He has faced charges of breaching the Official Secrets Act for leaking information about the role of army intelligence in running agents within the UDA who committed crimes including the targeting of Finucane. “There is as much chance of that happening as there is of Sir Jimmy Savile returning as a saint and making love to the Queen,” Hurst told the Guardian. He said he backed “100%” the Finucanes’ demand for a full, independent inquiry. “They should be entitled to the whole truth, not a version of it,” the ex-intelligence officer added. In his speech to the Commons, the prime minister said that both RUC special branch and the army group Hurst once belonged to, the FRU, had advance notice of assassinations the UDA was planning but took no action. One of the agents who was centrally involved in the Finucane murder plot was Brian Nelson, the UDA’s so-called intelligence officer at the time. FRU officers provided Nelson with intelligence files on IRA and republican suspects, which the former soldier then passed on to his UDA colleagues. On the army’s role, Cameron told MPs that the military and Ministry of Defence officials provided ministers with “misleading and in parts factually inaccurate advice about the Force Research Unit’s handling of Nelson”. Nelson was certainly not alone in terms of informants working inside the UDA. At least 29 members of the UDA in north and west Belfast were informers for at least one or more security force agencies at the time Finucane was shot dead. Intriguingly, the prime minister during his speech admitted that the attorney general in John Major’s government was under “considerable political pressure to ensure Nelson was not prosecuted”. Cameron said Sir Patrick Mayhew deserved credit for resisting these demands to protect the agent inside the UDA. Opposition politicians also expressed their dismay over the Finucane scandal and De Silva’s findings. Sir Menzies Campbell, the former Liberal Democrat leader, said he had never heard a statement in the Commons that filled him with more “revulsion” than the prime minister’s address. TAOISEACH Enda Kenny has challenged Gerry Adams to “tell the truth” about the death of Jean McConville and also appeared to link Sinn Fein to the Northern Bank robbery. In a strong attack on the Sinn Fein president, Mr Kenny said it was time Mr Adams told the truth about his past, specifically mentioning the mother of 10 who was murdered by the IRA. “I would love to hear you speak the truth about some elements of your past,” he said. “You might some day tell the truth about the tragedy and the remorse and about the compassion that should have been shown for Jean McConville. Maybe you might do that, Deputy Adams,” he added. Mr Adams asked Mr Kenny withdraw the remark, but the Taoiseach refused. Mr Kenny also raised the Northern Bank raid in response to Mr Adams’ claims about ministers being “millionaires”. “Deputy Adams has made a disgraceful comment about the ministers here today. I assure him that none of these people was funded by the Northern Bank or by the assets of the Northern Bank,” he said. The Dail was suspended after a furious row erupted between Mr Kenny and Mr Adams over the disappearance of Ms McConville. Mr Adams was criticising Mr Kenny, Fine Gael and Labour over the harsh measures contained in the Budget. But Mr Kenny told Mr Adams he wished he could detail the exact details of the Sinn Fein leader’s past. The spat led Ceann Comhairle Sean Barrett to suspend the house for 10 minutes. Mr Adams again protested when the Dail resumed. Mr Adams has repeatedly denied he was a member of the IRA and rejects allegations of involvement in the murder of Ms McConville. However, earlier this year, former IRA bomber Dolours Price described how Mr Adams ordered her to ferry captives, including Ms McConville, across the border to be murdered. Ms McConville was the most notorious of the cases of the so-called Disappeared, victims murdered by the IRA and whose bodies were then hidden south of the border. Mr Adams has faced repeated calls to make a Dail statement on Ms McConville’s disappearance. The Sinn Fein leadership has also denied any knowledge of the Northern Bank raid in December 2004. Leaked US Embassy diplomatic cables revealed former Taoiseach Bertie Ahern was “certain” that Mr Adams and Martin McGuinness had advance knowledge of the Northern Bank raid. A leaked dispatch reports that Mr Ahern was convinced the Sinn Fein pair had known of the £26.5m (€33.3m) robbery in 2004 because they were members of the “IRA military command”. The cable is dated February 4, 2005 and is among a batch released by WikiLeaks. A pistol used in the murder of Belfast solicitor Pat Finucane was handed back to the British Army by the RUC, previously unpublished papers show. New details about collusion between the RUC and the loyalist killers who targeted the 38-year-old in 1989 have been revealed in a report. The unseen chapter from the Stevens Inquiry is highly critical of the RUC’s “inadequate” investigation in the case and found officers deliberately destroyed vital evidence, while exhibits and records could not be found and fingerprints at the scene were not compared against suspects. It stated one of two murder weapons, a Browning pistol, was recovered by police but then given back to the British army, from where it had previously been stolen by loyalists. Mr Finucane’s son Michael said he is not surprised by the revelations. “Unfortunately, many other families are in a similar position to ourselves where they are finding out after the fact because the material has been held back for so long, that what they were told was a diligent and efficient and effective investigation was in fact anything but,” he said. Four chapters of a report by Sir John Stevens were published in 2003. In the newly-released nine-page chapter six, entitled Murder Investigation, Mr Stevens criticised the handling of the murder weapon by the RUC. “This was not a case of administrative oversight, or even some loss occasioned by a lack of care,” he wrote. “I believe it was a clear and deliberate decision to relinquish control of a key exhibit, resulting in the destruction of vital evidence. “The lack of records has prevented the identification of the person responsible for this decision. “The potential consequences of this particular disposal are obvious, with allegations made from the start of collusion between the security forces and loyalist paramilitaries. Stevens added the decision not only compromised a key exhibit, but also put any solider using it legally at risk of being implicated. Chapter six was released following a four-year battle by RTE reporter Richard Dowling under the Freedom of Information Act in the UK. Its contents emerged as a mural to commemorate the continuing legacy of Mr Finucane was unveiled close to where he grew up in west Belfast and days before a new report into his death is published. His widow Geraldine has vowed to keep up a campaign for a full public inquiry into the gun attack regardless of the findings of the review, being carried out by Sir Desmond de Silva. The Catholic father-of-three was shot dead when loyalist UDA/UFF gunmen used sledgehammers to burst in through the front door of his home in north Belfast in February 1989. Chapter six also examined the RUC’s handling of the investigation into Brian Adam Lambert, a Protestant killed by loyalists who mistook him for a Catholic. Sinn Fein President Gerry Adams described Mr Finucane as a remarkable, extraordinary and courageous Irishman. He also condemned the British government’s repudiation of the 2001 Weston Park agreement between the Irish and British governments which endorsed a public inquiry and their setting up of the de Silva review. “Whatever the outcome of the de Silva review all of us have a duty to fully support the Finucane family’s response to it. The family’s demand for a full, transparent and accountable public inquiry is reasonable,’ Mr Adams said at the unveiling of the mural. The politician recently revealed the de Silva review has also uncovered a loyalist plot to kill him. 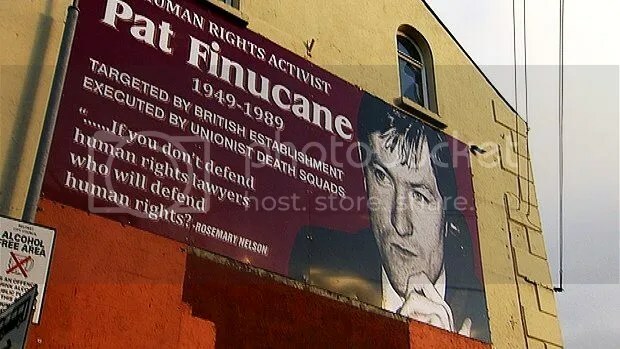 The mural to Pat Finucane was unveiled in west Belfast on Sunday. The family of Pat Finucane has gathered at a new mural in memory of the murdered solicitor, days before a report into his death is published. Mr Finucane was shot dead by loyalist gunmen who forced their way into his north Belfast home in February 1989. A report into the death of the Catholic father of three, conducted by Sir Desmond de Silva, will be published on Wednesday. On the same day Prime Minister David Cameron will make a statement to the House of Commons. On Sunday, a mural was unveiled on Beechmount Avenue in west Belfast, close to where the 38-year-old grew up. His widow Geraldine told UTV the Finucane family is still calling for a full independent public inquiry into the murder. “We’ve not participated in this review. We don’t know anything that went on. We don’t know who he has spoken to. We don’t know what he’s seen – and we won’t know,” she said. Mrs Finucane said Sir de Silva told her that his report would contain “hard-hitting conclusions”. “But we do know that he was shown sensitive material and he agreed not to put it in the report. That doesn’t inspire us with confidence,” she added. She welcomed the new mural which she said was painted in “part of Pat’s community”. “It’s very important that he’s recognised in his own community by the people. I’m delighted with the mural. It’s lovely,” she commented. Mr Finucane’s youngest son, John, said the unveiling of the mural had come at a very appropriate time for his family. He added they will read the de Silva report “with an open mind”. The Finucanes will travel to London this week to view the results of Sir de Silva’s inquiry, which cost £1.5m. It was ordered by Prime Minister David Cameron, who has admitted collusion took place and apologised to Mr Finucane’s family. Sinn Féin President Gerry Adams was also at the event to show the Finucane family his support. Mr Adams said the community in west Belfast knows what happened to Mr Finucane. “This community knows that collusion was an administrative practice,” he commented. “The family’s demand is very, very reasonable and I would call again on David Cameron and on the Irish government to use its influence on David Cameron to make sure that – regardless of the outcome of this DeSilva review -the family have the fully independent inquiry that they are looking for,” said Mr Adams. A photo of Michael Collins, taken just hours before his assassination rocked the country, has turned up after more than 90 years. 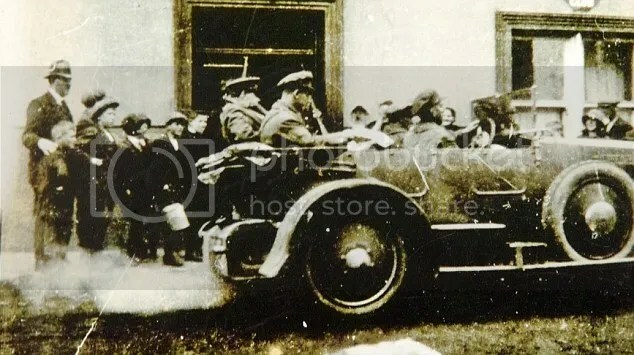 Killed in an ambush later that evening, Collins is seen in the back of a touring car outside a hotel in Bandon, Co. Cork. The remarkable photograph taken on August 22, 1922 by 18-year-old Agnes Hurley, has only come to light after being discovered in the attic of a Dublin house. Until now, the last photograph of ‘The Big Fellow’, as IRA leader Collins was known, had been assumed to be one taken in Bandon the day before, on August 21. 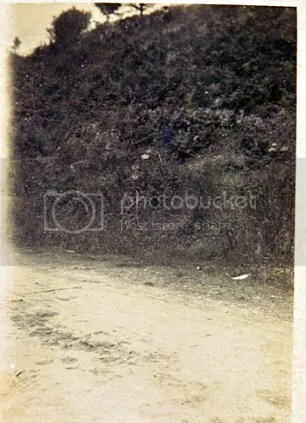 Hurley also captured the scene of the shoot-out near Béal na Bláth the next day, showing a scrap of cloth on the ground believed to be Collins’s shirt collar. Until now, historians assumed no photo of the scene was taken. Agnes ‘Aggie’ Hurley, from Mallowgaton in Bandon, used a brownie box camera and her remarkable collection of hundreds of photos spans 20 years dating from 1921. Her niece Mim O’Donovan, also from Bandon, brought the pictures to the Revolutionary Decade Roadshow in Clonakilty, Co. Cork, organised by the History Department at University College Cork on Saturday. ‘Aggie went to Béal na Bláth to see what had happened because they’d heard gunshots the previous day,’ she said. Cork City and County Archivist Brian Magee described the find as ‘extraordinary’. ‘The fact that it survived is remarkable,’ he added. Collins is an influential figure in the history of twentieth century Ireland. He was born in Clonakilty, County Cork, and, after working in a number of roles in London, returned to Ireland to take part in the Easter Uprising. He was elected as an MP for Sinn Fein for South Cork and Tyrone at the general election in December 1918. During the Anglo-Irish war he was a key part of the IRA’s military campaign. After the controversial treaty negotiations with Britain, he was appointed Chairman and Minister of Finance of the provisional government which was responsible for the establishment of the Irish Free State. He played a decisive role in devising a constitution, creating security forces and appointing a civil service. He was murdered while on an inspection tour of Munster and searching for a basis for peace with IRA leaders opposed to the Treaty. The photos will be scanned and archived to form part of the public record of a crucial period in Irish history.